If you ask me whether it is too early to start shopping for your holiday attires, I will say “no”; it is never too early for holiday dress shopping. 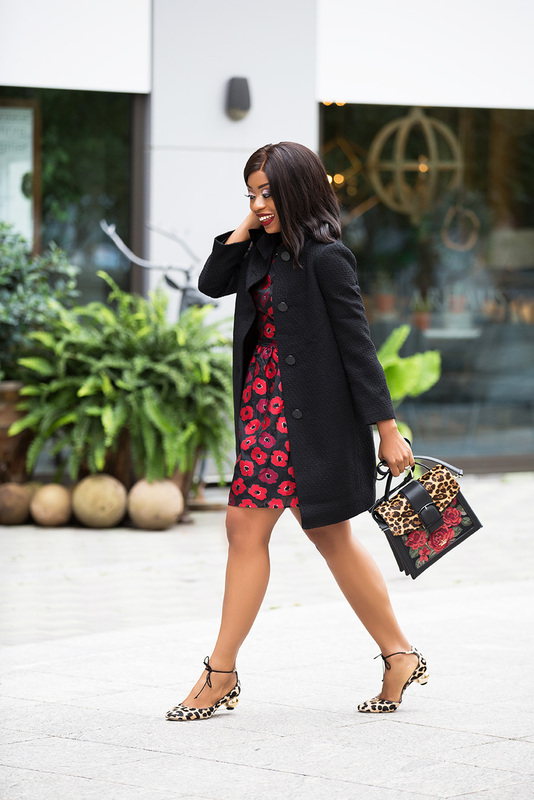 It is mid-October and a great time to start shopping or to simply treat yourself to a fabulous dress because you deserve it and this Kate Spade poppy dress is everything! The print was the first thing that caught my attention and the open back with a t-shaped bodice sealed the deal. This poppy embellished mini dress comes in other three colors: black, cream and blush. I decided to style the floral print version in two different ways. I took a formal approach with black pumps and a poppy cross body bag to complement the dress. This look makes it a great event/party look. For a casual approach to styling the dress, I paired it with lower heeled leopard shoes and a leopard print "box shape" bag. The leopard/floral mix bag also complements the shoes and the dress. This causal approach will be an ideal style for hanging out with friends or on days when you don't feel like wearing high heeled shoes. This post is sponsored by Kate Spade. As always, all opinions are mine. This dress looks amazing on you! Love how you mixed the prints. Also, love, love, love how you find the perfect bag for each look! Its looking super and stylish Collections of dresses. Trendy passionate and modern cloths. Please try to Post Beautiful Sarees and Kurtas. You look fabulous rocking that Kate Spade poppy jacquard dress!!!!!! Your makeup looks very pretty.